VANCOUVER, Washington – Marking crews from the Columbia River Fish and Wildlife Conservation Office of U.S. Fish and Wildlife are at the Carson National Fish Hatchery in Washington state this week PIT tagging 20,000 juvenile Spring Chinook. PIT stands for passive integrated transponder. Five thousand tagged Chinook will be transferred to the Confederated Tribes of Umatilla Indian Reservation for release in the South Fork of the Walla Walla River. The rest (along with 1.4 million mass marked for harvest but not PIT tagged) are released onsite into the Wind River in Washington. 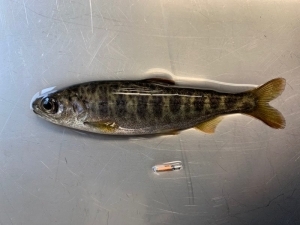 PIT tags allow for individual fish identification and can be detected at PIT antennas on Columbia River dams, remote antennas and handheld antennas. These help the Columbia River Fish and Wildlife Conservation Office understand timing of fish movement, survival, and much more unique information that allow for better resource management.